Limited edition digital print on canvas. Embellishment varies and is unique to each item in the edition. Numbered and signed by the artist Image size: 16 " X 22 ". Through his vibrant colors, playful themes and hard-edged compositions, Romero Brittos art captures the attention of both youthful spirits and educated art collectors. It is this unique talent which has established Brittos reputation and granted him a significant presence in the US, Europe, and Asia. In a multitude of media, Brittos art contains endless themes and images, portraying small personal stories of life experiences. Easily recognized, Brittos work is unmistakably modern, bold, and colorful. His style often combines the artistic techniques of Pop Art with the intricate compositional qualities of Cubism. In an effort to bring his work to the masses, Brittos work is constantly changing, thus challenging the meaning of art. The natural inclination for Britto to express himself visually became apparent to those around him at a very young age. He often painted images from his active imagination on scraps of cardboard and newspapers in his hometown of Recife, Brazil. In 1987, Britto traveled to the United States to challenge his talents among other Pop Art heavyweights. Since then, he has gained entrance to art exhibitions such as FIAC Paris, Art Salon Hong Kong, and numerous world tours. His work has captivated corporate collectors like Pepsi Cola International and ABSOLUT Vodka. To date, Romero Britto continues to fulfill his dreams with an inexhaustible momentum. Britto maintains that Art is too important not to share. He often dedicates his time and talent to worthwhile organizations and charities, such as Andre Agassi Foundation, Ormand Street Childrens Hospital in London, St. Judes, the American Red Cross, and Best Buddies. His paintings grace the collections of heads of state, European nobility, and superstars of the athletic, entertainment, and business worlds. Since everything in life moves towards one final end, we should fill our life with color and hope. Such is the ideal of one truly dedicated individual, Romero Britto, an artist true to himself. Sundook Fine Art Galleries was founded in 1979. Today we are one of the premier fine art galleries in the country. We feature original paintings, limited editions, bronze sculptures and acrylic sculptures, all from the most highly acclaimed artists nationally and internationally. 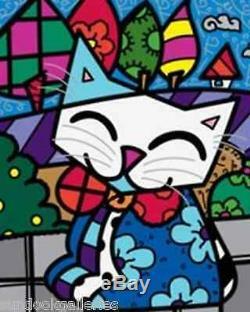 The item "ROMERO BRITTO MIDNIGHT CAT LIMITED EDITION ON CANVAS" is in sale since Monday, August 5, 2013. This item is in the category "Art\Art Prints". The seller is "sundookgalleries" and is located in Boca Raton, Florida. This item can be shipped to United States, Canada, United Kingdom, Denmark, Romania, Slovakia, Bulgaria, Czech republic, Finland, Hungary, Latvia, Lithuania, Malta, Estonia, Australia, Greece, Portugal, Cyprus, Slovenia, Japan, Sweden, South Korea, Indonesia, Taiwan, South africa, Belgium, France, Hong Kong, Ireland, Netherlands, Poland, Spain, Italy, Austria, Israel, Mexico, New Zealand, Singapore, Norway, Saudi arabia, United arab emirates, Qatar, Kuwait, Bahrain, Croatia, Malaysia, Chile, Colombia, Costa rica, Panama, Trinidad and tobago, Guatemala, Honduras, Jamaica, Barbados, Bangladesh, Bermuda, Brunei darussalam, Bolivia, Ecuador, Egypt, French guiana, Guernsey, Gibraltar, Guadeloupe, Iceland, Jersey, Jordan, Cambodia, Cayman islands, Liechtenstein, Sri lanka, Luxembourg, Monaco, Macao, Martinique, Maldives, Nicaragua, Oman, Peru, Pakistan, Paraguay, Reunion, Thailand, Germany, Ukraine, Bahamas, Viet nam, Uruguay. Size Type/Largest Dimension: 16" x 20"